Although iOS 12 comes with many amazing features and really enjoyed lots of downloads, it has also gotten various negative feedbacks from users, especially on overheating. While it isn’t uncommon to have issues following iOS updates, it is something that calls for concern. Temperature degree, multiple running apps, overcharging, and so on are likely causes of overheating. How about we consider a few hints to tackle the problem. When you have numerous third-party apps stored up and running on your iPhone, it leads to overheating problems, and also makes the device unnecessarily slow. When this happens, there might be need to clear your iPhone RAM. iMyFone Umate Pro is the Ultimate cleaner which provides an easy, fast, and effective procedure for clearing your device RAM. 1-Click cleanup which allows you to clean up hidden junks and temp files that are lurking around on your iPhone, thereby increasing performance speed. Saves space on your device by cleaning out unused files, freeing up temporarily downloaded files, compressing and clearing large files, etc. Wipes out leftover junks, corrupted files and incomplete traces from third-party apps and even junks created by the iOS itself. Freeing of iPhone RAM with iMyFone Umate Pro is totally free. 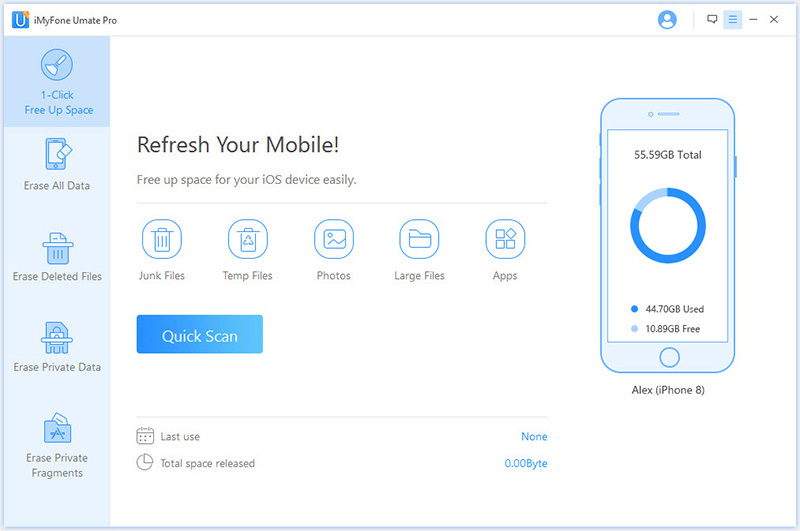 iMyFone Umate Pro has the unique feature of iPhone Data Eraser which helps to clean up junks, corrupted files, and delete fragments left behind by third-party apps. It is the Ultimate space creator that comes with amazing features for clearing RAM. Step 1. Connect your iPhone to your PCand launch iMyFone Umate Pro. Step 2. In the software home screen, Choose 1-Click Free Up Space mode, and on the next screen, click the Quick Scan button. Step 3. Once the scan is completed, click on the “Clean” buttons beside the Junks Files and Temporary Files to clean the RAM of your device. 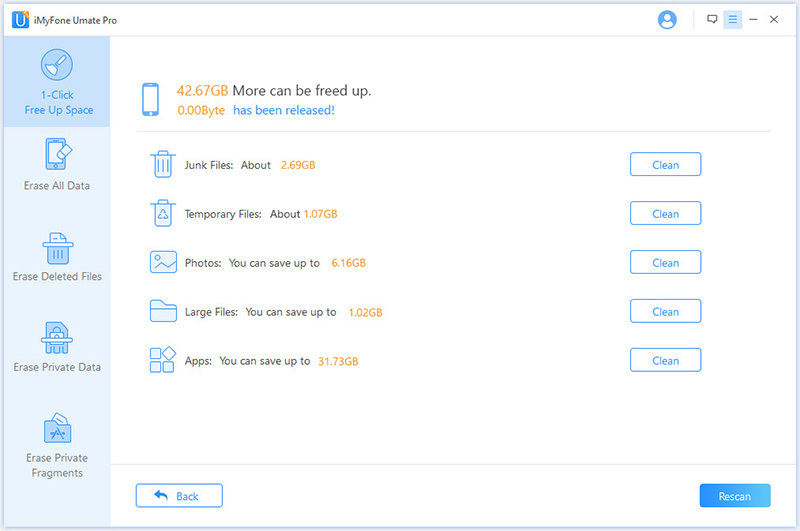 iMyFone Umate Pro instantly cleans them up and even shows you how much space got freed up. Deletes all kinds of data from your iDevice permanently, and overwrites it. Erases deleted contacts and data, with 0% recovery possibility. Allows you to select data individually, and preview them before erasing. Wipes data from third-party apps: Whatsapp, Viber, Kik, WeChat, Flickr, etc. As is known to all, iOS keeps previously opened apps running in the background, and this adds more workload on the processor. The more commands your device carries out per time, the more it gets exhausted and overheats. Consequently, it is advisable to close all background apps as often as possible to lessen workload and overheating tendencies. 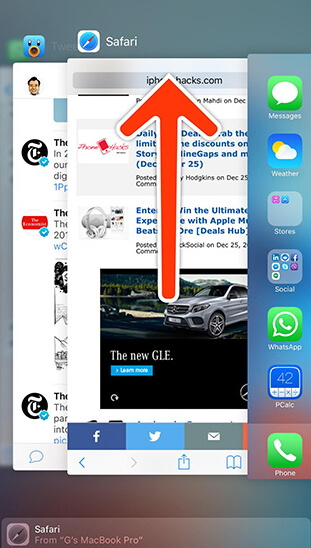 Press the Home button twice to display opened apps thumbnails. Repeat until all opened apps are closed. Phone charging is a heat-generating activity. While it is understandable that we bunch of work on our phones, thus requiring it to be in constant use, it is important to avoid using your iPhone while it’s charging. Leave it to get full, and use afterward. Sometimes, iOS 12 overheating due to overworking and just needs to rest and reload. So next time you notice overheating, simply restart it by turning it off for some few minutes, and then back on. This gives the device some time to cool off. When encountering iOS 12 overheating issues, one sure solution is to reset all your current settings. 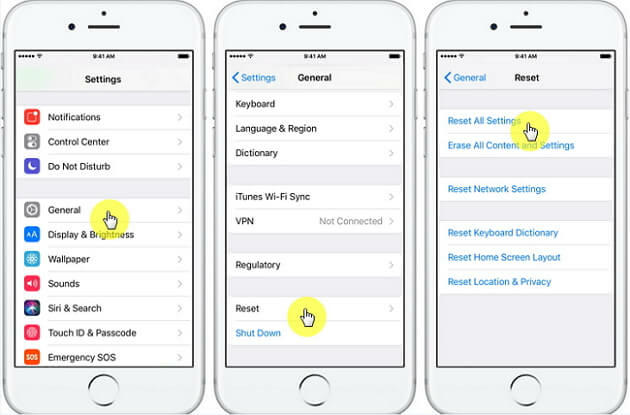 As a matter of fact, tons of iOS issues can be solved just by resetting the device settings. This process actually resets your device to default settings, so it clears the settings you have previously made, like home screen layout, themes, language, keyboard, privacy settings, Wi-Fi networks, passwords, etc. Enter your Password if asked, and Click Reset All Settings again. Your device settings will restart with the default settings. More than frequently, this method dependably fixes iOS 12 overheating issues on the iPhone, plus other problems caused by malfunctioning apps. So you might want to give it a shot next time your iPhone overheats and check if it works- it most likely will.